Officials overseeing the hunt for missing Malaysia Airlines Flight MH370 said the search will be completed by April 2015. But one expert has said that it could take “months to years” to locate the wreckage or black boxes from the plane. The searchers have remained optimistic in finding the plane, which disappeared March 8 with 239 people on board, to give families of the passengers a sense of relief. Judith Zielke, the head of the coordinated efforts in finding the plane’s wreckage, said the search is slow and tedious. Searchers are moving around two miles per hour amid bad weather conditions at times, reported the Rakyat Post in Malaysia. “It will take until April next year to finish searching the entire area. I pray every day that today is the day,” Zielke was quoted as saying in the report, published Tuesday. ...and deep. But I'm keeping hope alive that it is near the 7th arc and will be found. A deep-sea sonar search for the missing Malaysia Airlines (MAS) Flight 370 will find its wreckage, the lead investigator said after 263 days of scouring the seas yielded nothing. Searchers for the plane, which disappeared March 8 with 239 people on board, are “very confident” the plane will be found along an arc in the southern Indian Ocean matching the last transmission from the plane, said Peter Foley, director of the MH370 search at the Australian Transport Safety Bureau. “We’ve got a good area defined, and we believe that the search methods we’re using will be effective in locating that debris field,” Foley said at a briefing in Canberra today. Malaysia Airlines Flight MH370's engines are likely intact on the ocean floor and could play a key role in locating the missing jetliner, officials said Wednesday. Three specialized search ships have mapped 65,600 square miles of seabed — an area about the size of Florida — without finding a trace of the aircraft that vanished almost nine months ago. Investigators have now calibrated their search equipment to the specific size of the Boeing 777's giant turbofan engines — which are the largest of any commercial airliner. "When we stipulated the requirements for the current search we thought about the smallest items that we would need to detect and we knew that the aircraft engines and the landing gear would remain relatively intact," Australian Transport Safety Bureau search coordinator Peter Foley told a press conference in Canberra. "The other possibility of course, if the aircraft is relatively intact, is we may see something a bit more complete in terms of the structure of the aircraft." The theory is based on Air France Flight 447. (Reuters) - Australia is working on new drift modeling to expand the geographical area in which wreckage from missing Malaysian Airlines flight MH370 may come ashore, the Australian search coordinator said on Wednesday. Initial analysis had suggested that the first debris from the plane could come ashore on Indonesia's Western Sumatra after about 123 days. "We are currently working ... to see if we can get an updated drift model for a much wider area where there might be possibilities of debris washing ashore," search coordinator Peter Foley told reporters in Canberra. Foley said the research center was receiving reports at least once a week of debris washed up on the Australian coastline, but none has so far been identified as coming from the missing aircraft. Fugro Discovery arrived at Fremantle on 23 November for resupply. Following calibration testing on 25 and 26 November, it is expected that the vessel will continue on to the search site. Fugro Equator arrived in the search area on 21 November and commenced bathymetric survey operations. An additional 4,000 square kilometres have been surveyed so far. GO Phoenix continued to conduct underwater search operations in the assigned search area this week and is due to depart the search area today to return to Fremantle for resupply. Over 7,000 square kilometres of the seafloor have been searched so far. Such a huge undertaking. I continue to hold hope there will be answers. Malaysia Airlines is preparing to collect DNA samples of the families of those on board missing Flight MH370, the company revealed during a briefing session on Tuesday night, The Malaysian Insider reported. The exercise is reportedly similar to the one conducted to identify the victims of Malaysia Airlines Flight MH17. The company made the announcement during a two-hour session at the Malaysia Airlines Academy, Syafinaz Hasnan, the sister of crew member Mohamad Hazrin Hasnan reportedly said. She added that the company did not mention any specifics about when and how the samples would be collected. The briefing was reportedly attended by nearly 35 family members of passengers and crew of the missing plane. “They said we now need to provide our DNA samples to the authorities for safekeeping and in case they found the wreckage or remains,” Syafinaz told The Malaysian Insider. Fugro Equator continues to conduct bathymetric survey operations. Fugro Discovery departed Fremantle for the search area on 29 November. GO Phoenix departed the search area on 26 November to return to Fremantle for resupply and arrived on 2 December. In addition to locating the aircraft, the underwater search aims to map the MH370 debris field in order to identify and prioritise the recovery of specific aircraft components, including flight recorders, which will assist with the Malaysian investigation. The ATSB has utilised the data from the bathymetric survey work to prepare the initial plan for the underwater search, to be followed and referred to by all parties involved. The plan includes search timings, methods, procedures, safety precautions and the initial search areas for the various vessels. Fugro Equator continues to conduct bathymetric survey operations in the search area and is expected to return to Fremantle in mid-December following completion of the current phase of survey operations. Fugro Discovery arrived at the search site on 4 December and recommenced underwater search operations. GO Phoenix returned to the search area on 9 December and recommenced underwater search operations. The equipment used on the vessels is providing extraordinary data. The image below is a synthetic aperture sonar acoustic image of the seafloor gathered by GO Phoenix. This is indicative of the resolution and quality of the data and that it is revealing important detail of the seafloor. Sea states in the area assigned to GO Phoenix are anticipated to range from 1 to 3 over the next four days. In the area assigned to Fugro Discovery, sea states will range from 1 to 4 with a ridge of high pressure dominating the area. Overall conditions are expected to continue to be generally favourable during the summer months. THE Joint Agency Coordination Centre said on Sunday that investigators could finish scouring the priority zone of the Indian Ocean by May if there were no delays with vessels, equipment or weather. But on Wednesday, JACC revealed the vessel Fugro Discovery had a "system issue" with a component of the search equipment. "Search activities have been suspended while the issue is remedied," it said. Also, JACC told AAP the Australian Transport Safety Bureau had advised that measures to fix Fugro Discovery's problem were being trialled and the results would be reviewed. "Until that process is complete, the extent of the issue's effect on the progress of the underwater search is unknown," JACC said. Meanwhile, other search efforts will continue during the festive period. The Fugro Equator is scheduled to depart for Fremantle on Wednesday after finishing its current survey, and the GO Phoenix continues its underwater search. More than 200,000 sqkm has been surveyed and 11,000 sqkm of the sea floor has been searched. Fugro Equator is scheduled to depart the search area for Fremantle today following completion of the current phase of survey. On Saturday 13 December, Fugro Discovery experienced a system issue with a component of the search equipment. Search activities have been suspended while the issue is remedied. Fugro Equator ceased bathymetric survey work on 17 December and returned to Fremantle for mobilisation to conduct underwater search operations. It arrived in port on 22 December. Fugro Discovery recommenced search activities after they had been suspended owing to a system issue with a component of the search equipment. Fugro Equator completed bathymetric survey work in the search area on 17 December. Around 208,000 square kilometres of the search area have been surveyed. Over 12,000 square kilometres of the seafloor have been searched. Assuming no significant delays with vessels, equipment or from the weather, the current underwater search area may be largely completed around May 2015. 1. The Malaysian pilot was on a government sanctioned mini 9/11 targeted suicide mission in the name of Allah. He was embracing a spiritual purpose when he turned MH370 around and headed west across the Malaysian Peninsula towards the Indian Ocean and ... then continued west to the Maltives Islands and ... then turned south toward the Diego Garcia military base. 2. The Malaysian pilot crashed MH370 into a strategic target on Diego Garcia or ... the plane with 237 unconscious passengers and crew was shot down over the island by the US Military when it was realized an attack was imminent. Either way the implication is that the wreckage of MH370 is not in the ocean. 3. Britain/US and Malaysia have respective underlying political reasons to distract the world's attention away from Diego Garcia as the location where MH370 came out of the skies on the morning of March 8, 2014. 4. Respective searches for MH370 in the South China Sea and the South Indian Ocean were attempts by Britain/US to divert world attention from a top secret US Military base in the Indian Ocean as well as an attempt by Malaysia to distract from a government sanctioned a mini 9/11 attempt. 5. The Malaysian pilot had planned and practised on his home flight simulator how he would render passengers/crew unconscious ... how he would reach Diego Garcia undetected ... how he would crash MH370 into a strategic target on the Island thus hindering the anti-Islamic objectives of the top secret US military base. Pre-planning would imply an adequate fuel supply to reach the Island. 6. In the early morning hours of March 8, 2014 all passenger and crew on board MH370 were asphyxiated when the Malaysian pilot reportedly ascended to and stayed at a maximum altitude for over twenty minutes as he made his westerly turn from the South China Sea. The pilot was privy to an independent oxygen supply inside his locked cockpit during that period. 7. The pilot failed to consider the possibility that residents of Kuda Huvadhoo in Dhaal Atoll in the Maldives would observed a low-flying jumbo jet flying over the Island on the morning of March 8, 2014 headed in the direction of Diego Garcia? 8. Considering the lack of any ocean evidence ... MH370 either crashed into a targeted strategical location on Diego Garcia or was defensively shot down when it entered the air space over a top secret US Military base? 1. Why would the Malaysian pilot fly for over seven hours attempting to avoid detection only to crash MH370 into the Southern Indian Ocean when he could have accomplished the deed with no preparation by ditching the plane in the South China Sea somewhere on the flight path between Malaysia and Beijing? 2. British Inmersat denied the request of relatives of MH370 passengers/ crew to submit their satellite data to them for independent analysis. 3. Diego Garcia ... a top secret US military base in the middle of the Indian Ocean is leased from Britain and ... has reportedly served as a US base for launching/refuelling planes that were heading to Middle East conflicts. 4. 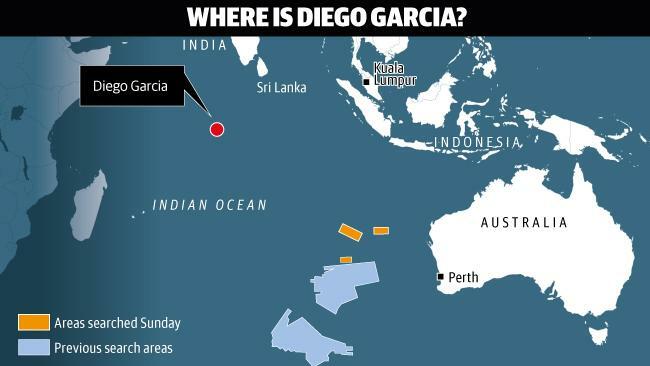 It has also been reported that Diego Garcia served as a detention centre for the purpose of interrogating suspected Islamic terrorists prior to being transferred to Guantanamo Bay. 5. Malaysia took four hours to respond when it was informed by Vietnam air controllers that MH370 failed to enter its airspace on the scheduled path to China. In the meantime Malaysia deceived Vietnam air controllers by implying the location of plane on the flight path to Beijing was known. 6. Malaysian defence failed to intercept an unidentified/ unscheduled aircraft flying west over the Malaysian Peninsula during the early hours of March 8, 2014. My theory implies that that the pilot had his own supply of oxygen in his locked cockpit? During this 20 minute period of time the pilot made that reported turn and ... then proceeded to make that reported 5,000' to 4,000' descent as he flew the aircraft over Malaysia towards the Indian Ocean? Contrary to official denials ... could it be that upon reaching the Indian Ocean the pilot continued WEST ... not SOUTH ... towards the Maldives where residents reported a "low flying" airplane ... toward the runway at Diego Garcia that was reportedly programmed into his flight simulator? If MH370 crashed into a strategic location on Diego Garcia or ... was shot down defensively ... it would provide an explanation why not one piece of wreckage has been recovered from the ocean. The search for missing Malaysia Airlines flight MH370 has now covered an area of ocean floor the size of Connecticut, investigators said Wednesday as they announced a plan to prioritize the hunt for the jet's missing black boxes. More than 5,400 square miles of the bottom of the southern Indian Ocean have now been searched without any sign of the Boeing 777, the Australia Transportation Safety Bureau said in an operational update, and more than 80,000 square miles of sea bed have now been mapped by specialist vessels. "Assuming no significant delays with vessels, equipment or from the weather, the current underwater search area may be largely completed around May 2015," the update said. Fugro Equator departed Fremantle on 6 January, having completed mobilisation to conduct underwater search operations. Fugro Discovery arrived in Fremantle on 6 January for resupply and operational maintenance. The vessel is anticipated to depart for the search area around 9 January. GO Phoenix arrived in Fremantle on 2 January for resupply and operational maintenance. The vessel departed for the search area on 5 January 2015. Fugro Equator completed bathymetric survey work in the search area on 17 December and returned to Fremantle to be mobilised for the underwater search. To date, around 208,000 square kilometres have been surveyed. Over 14,000 square kilometres of the seafloor have been searched. Thank you for continuing to update this thread, grace-land. I'm holding hope there will be answers for this tragedy.